Of course, you know just how important it is to brush your teeth regularly. But you might be surprised to hear that you might be brushing all wrong! You might not be caring for your teeth as well as you thought. These easy step-by-step instructions for brushing will help you make the most out of your oral care routine and ensure that your teeth and gums are as healthy as can be. Think of your toothbrush as the tool for your oral care. And you need the right tool to get the job done right. An impeccable brushing routine comes from using the right toothbrush, which means a toothbrush with soft bristles that are made of nylon. This type of toothbrush is best for removing debris and plaque buildup on your teeth, while keeping your enamel and gums at peace. What’s more, make sure that the head size is small enough to reach all of your teeth. Otherwise, your back teeth might miss out on your cleaning. If you consider yourself a lazy tooth brusher, then go for an electric toothbrush. Its rotating head and oscillating action will make up for the lack of brushing on your end. Remember to change your toothbrush every three months, when the bristles wear, or when there’s plaque buildup on the bristles. The second tool you’ll need for an impeccable brushing technique is fluoride toothpaste. You might be surprised to hear that to do an adequate job at brushing, you actually only need a pea-sized amount of toothpaste on your brush. Less toothpaste will help you sustain the cleansing action since you won’t be spitting out the froth as often. For effective brushing, keep your bristles at a 45 degree angle with your gum line. To get the most out of your brushing action, never brush directly across your teeth. Instead, use short circular and vertical motions to go around the teeth. Don’t give up too quickly! You must spend at least a full three minutes brushing. 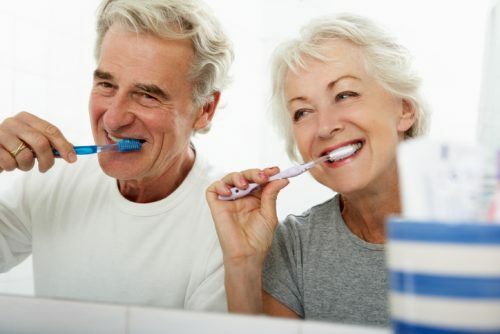 Brush a few teeth at a time, for a few seconds at a time, then move on to another section. Many people forget to brush their molars. Or, they just can’t reach and give up. To get to the teeth further back in your mouth, ensure your brush is perpendicular with your lips, and use an in-and-out motion. The inner surface of teeth is commonly skipped during brushing as well. Remember to keep brushing at that 45 degree angle to get into this space. You can either use your toothbrush as you normally would to brush your teeth, or use a tongue cleaner, but either way, make sure that you brush your tongue. To get rid of all of the toothpaste and dislodged debris, remember to rinse your mouth with water, gargle, and spit. Rinse your toothbrush as well to keep it clean. Though completely optional, you can choose to use mouthwash at the end of the brushing procedure if you wish. Though flossing is hated by many, it’s a critical step for cleaning between the teeth to remove plaque and bits of food that can lead to cavities and tooth decay. It can also help you avoid bad breath. Discard the first 45 centimeters of floss. Wind the two ends into your middle fingers. Hold the floss between your forefinger and thumb without slack, leaving an inch between them. Rock the floss, or dental tape, between your teeth, and once it touches your gum line, move it against the tooth in a C-shape, hold, then gently scrape the sides of the tooth. A poor brushing technique can lead to bleeding gums, dental caries, plaque, cavities, and even abscesses. This step-by-step guide for brushing, along with regular visits to your dental practitioner, can help you keep your teeth clean and healthy.